2-0-1 in his three matches-and his back-to-back Verizon Heritage wins. 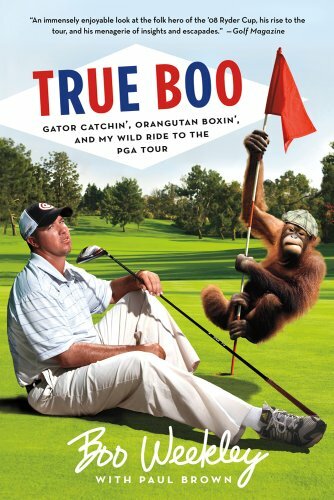 With stories from the Tour, frequent down-home phrases, figures of speech, locker-room tales, plenty of "Booisms" and never-before-seen photos, this is a golf book unlike any other. THOMAS BRENT “BOO” WEEKLEY is an American professional golfer who plays on the PGA Tour. His great sense of humor, phenomenal swing, and unconventional life story have made him one of golf’s most beloved athletes. Nicknamed after cartoon character Yogi Bear’s sidekick, “Boo Boo” Bear, Boo loves to fish and hunt and is sponsored by the outdoors apparel company Mossy Oak, which specializes in camouflage apparel. He lives in Florida. Paul Brown is a freelance journalist who writes regularly for magazines such as FourFourTwo. His previous book, Black and White Army, was described as a 'Geordie Fever Pitch'. He lives by the banks of the River Tyne and is a long-suffering supporter of Newcastle United.